This Wednesday, September 25th we'll be live streaming again. We'll start at 16:00 GMT, and you be will see something special this time because the entire stream will be set on night maps. Nav lights, flare guns and other useful and eye-catching features of IL-2: BOS. Our Twitch channel welcomes you at http://www.twitch.tv/il2sturmovik (the Russian http://cybergame.tv/il2sturmovik/ may work for you as well, just pick Original quality setting). As before, the record will be published with English subtitles on our YouTube channel with the next Friday dev blog update. We're glad to present you the 33rd update of the Devs blog. 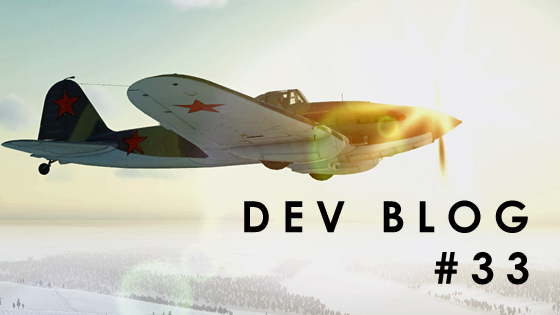 This time it features a story by Daniel Tuseev, 1CGS Project manager, who tells about the evolution of flight models since older flight sim games and the key advanced features of IL2BOS flight model particularly. Also a pack of brand new screenshots with ground vehicles on them has been released. The event with choosing a unique skin for LaGG-3 has reached the next stage, and if you are a founder already then simply go to the Founders group now and vote for one of the 5 candidates. The winning picture will become a prototype for the unique aircraft skin exclusively available to pre-order owners. By the way in case if you haven't activated your pre-order key yet and you've got no idea how to do it, then take a look at the instruction that we prepared for your comfort. We’ve successfully distributed digital keys to everyone who’s pre-ordered the game. You can check it out right away on you Profile page and activate your pre-order. Also every key before it’s activated can now be sent as a gift to any other user. And some news for those who have already pre-ordered the game – we’ve launched a special subforum called Founders Group. For details, please, click here. And we also present you the record of the latest live stream with the special guest – project’s Lead engineer Andrey Solomykin aka Petrovich. Our traditional Friday dev blog update today sheds some light on the issues you've been wondering about in your questions to the developers. To know about our plans and importance of the forum polls, to learn about the account model and Rise of Flight's recent launch on Steam - click here and jump to the IL2:BOS forum. Today’s 30th anniversary Dev blog note is a perfect occasion for some presents, don’t you think? Both these additions will be available to you the very first day when IL-2: BOS is released. The IL-2 skin is unique and cannot be unlocked while playing the game. More good news - we have decided to extend the early-access pre-order program for one more month until October 1st! Over the past few weeks we have revealed more and more information about the project, our technology, the team and our goals. Now many more potential pilots can make an informed decision about BOS and still participate in our pre-order program. We hope they will want to join you in the skies above Stalingrad this year. In addition to extending the pre-order program, anyone who has already placed or will place an order before October 1st will receive a special skin for the Bf-109 F4. This is just one of several other bonuses that will be announced for those that place a pre-order before the deadline. Stay tuned! And finally the biggest news so far - both the Standard and Premium editions of BOS will now include all 8 flyable aircraft as a launching set of aircrafts! We always listen to our community’s opinion and we respect your input and concerns. Therefore we have decided to give all users the Yak-1 and Bf-109 G2 as part of the basic package. The dogfights will surely be epic fun for all.